Carol has attended births for more than 35 years. She has been a professional doula and bodyworker since 1990. Carol was a certified Birthing From Within mentor from 2001 to 2008. She was an unlicensed Oregon homebirth midwife from 2000 to 2012. Carol has been licensed to practice massage in both Oregon (#3150) and Washington (#MA 00004670) since 1990. She is a certified yoga teacher (RYT 200) and a certified prenatal yoga teacher (RPYT). Carol is a former Birthing From Within Mentor Advisor and a former Birthing From Within Doula Trainer. 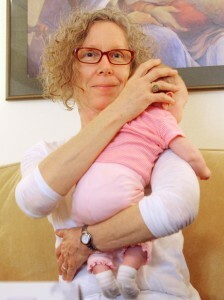 She completed her doula training at the Seattle Midwifery School with Penny Simkin. Carol has studied bodywork modalities with various people including Meier Schneider, Rich Phaigh, Rosita Arvigo, Lindy Ferrigno, Suzanne Scurlock Durana, Anat Baniel, Fritz Smith, Frank Lowen, Jeffrey Burch, Alain Gehin, DO, Claudia Cohn, DO, Tami Kent, MSPT, Liz Koch, Katy Bowman, Michelle Emanuel, Etienne Peirsman, Gail Tully, Alison Hazelbaker, PhD, Ellen Mossman, Jennifer Merciér, Teresa Robertson, Maxine Haller and many more. She has completed much of her CranioSacral Therapy training, including advanced, obstetric and pediatric specialty work, with the Upledger Institute. Carol has studied directly with Dr. John Upledger, the founder of this work. She was a teaching assistant for the Upledger Institute for all levels of CranioSacral Therapy training including advanced, pediatrics and cadaver dissection. Carol completed Bodywork for the Childbearing Year and Bodywork for the Childbearing Year Postgraduate Training with Kate Jordan and Carole Osborne-Sheets. She has also trained directly with Pam England, author of Birthing From Within. No list of influences would be complete without mentioning Karen Strange and her fabulous neonatal resuscitation classes taught from an infant consciousness point of view. Carol holds an RYT 200 and RPYT certifications from Yoga Alliance. She completed prenatal yoga teacher training with Marisa Toriggino at Yoga Garden San Francisco. Carol has also studied yoga with Doug Keller, Leslie Howard, Leslie Kaminoff, Shiva Rea, Tiffany Cruikshank, Julie Gudmestad and many others. She regularly attends continuing education training for midwives, lactation consultants, childbirth educators, yoga teachers and bodyworkers. She is committed to lifelong learning. Carol Gray is approved by the National Certification Board for Therapeutic Massage and Bodywork (NCBTMB) as a continuing education Approved Provider. Carol is Board Certified for Therapeutic Massage and Bodywork, a Certified Pregnancy Massage Therapist. She holds E-RYT 200, YACP and RPYT certifications from Yoga Alliance. Carol is a member of The Association for Prenatal & Perinatal Psychology & Health, The American Massage Therapy Association, Oregon Midwifery Council, Northwest Cranial Association, The International Consortium of Ankylofrenula Professionals, Yoga Alliance and Portland Doula Association. She is a past examiner and current Rules Committee member for the Oregon Board of Massage Therapists and a past American Massage Therapy Association – Oregon board officer. The Upledger Institute has revoked the credentials, certifications and practitioner directory listings for people (including Carol) who teach CST independently.